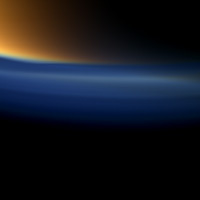 These views from NASA's Cassini spacecraft look toward the south polar region of Saturn's largest moon, Titan, and show a depression within the moon's orange and blue haze layers near the south pole. The close-up view was captured with the narrow-angle camera. Another view taken a second later with the wide-angle camera is also included here for context. The moon's high altitude haze layer appears blue here whereas the main atmospheric haze is orange. The difference in color could be due to particle size of the haze. The blue haze likely consists of smaller particles than the orange haze. The depressed or attenuated layer appears in the transition area between the orange and blue hazes about a third of the way in from the left edge of the narrow-angle image. The moon's south pole is in the upper right of this image. This view suggests Titan's north polar vortex, or hood, is beginning to flip from north to south. See PIA08137 to learn about Titan's north polar hood. To learn about changes since Saturn's August 2009 equinox, see PIA11603 and PIA11667. The southern pole of Titan is going into darkness as the sun advances towards the north with each passing day. 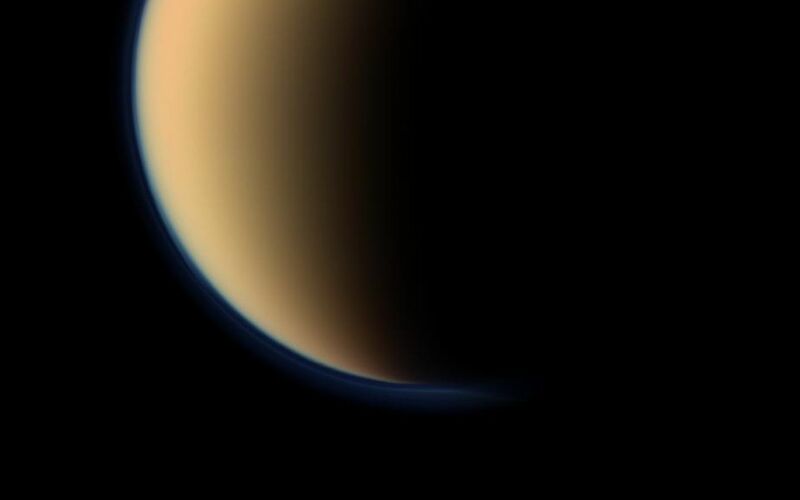 The upper layer of Titan's hazes is still illuminated by sunlight. Images taken using red, green and blue spectral filters were combined to create this natural color view. The images were obtained on Sept. 11, 2011 at a distance of approximately 83,000 miles (134,000 kilometers) from Titan. Image scale is 2,581 feet (787 meters) per pixel.